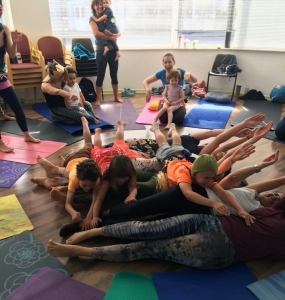 Yoga is a fun way for children to develop a variety of important skills in a nurturing, non-competitive environment. From a young age children begin to experience pressure to preform academically and socially. Add to this the pressure of competitive organized sport and it is easy for a children to become overly self critical, and lose confidence in themselves. During this time, yoga can be a great remedy for the tension associated with daily stressors as well as an important facilitator of healthy physical, emotional and cognitive development. People speak about the importance of health and exercise, the importance of education, the importance of discipline… but what about the importance of FUN? It makes you happy and therefore healthy! Woo-Hoo! Endorphins! As opposed to fear, its a much safer environment to learn in. It helps us release tension. It creates space to explore and release unprocessed emotions. It creates an atmosphere where we can freely interact and communicate. Because FUN always involves interaction with other people, we learn to play and live under certain rules of mutual respect, which is the only way to keep the fun going.